It is said that there are no coincidences. Such is the case with 577 West 161st Street in Washington Heights, New York. The initial six-story project, which was originally permitted by a physician, consisted of multiple medical offices. However, shortly after excavation began, the initial development team abandoned the project. Sensing an opportunity, PM Architecture PC stepped in as architect, developer, and builder. The first order of business was to redesign the project, placing the medical offices on the cellar and ground floors and introducing five upper floors of apartments. These units are primarily market rate, ranging in size from approximately 375 to 525 square feet. These sizes fit the neighborhood perfectly. The building has been occupied since October 2018. Its tenant mix consists predominantly of college students and young professionals working at the local hospital and tech companies. Many have said they are drawn to the building’s unique and modern elements, such as the polished concrete floors and the unusual façade, which features graphic diagonal lines in the exterior insulation and finish system (EIFS). Assuming the role of developer was an easy decision, as Parag Mehta, PM Architecture’s principal, and other family members jointly own Technocraft, a construction company. PM Architecture maintains close ties with this company; it is the architect of record for most of the construction firm’s projects. Construction on the new structure started in 2016. Having completed several LEED projects in the past, the nine-person firm is strongly grounded in energy-efficient and sustainable design. Once Parag Mehta was exposed to Passive House principles, he was inspired to take PHIUS’s consultant training. Other staff members are educated in environmental science and have attended Passive House seminars. Even so, the firm had never tackled a Passive House building. However, being able to act as architect, developer, and builder, PM Architecture could control costs. It decided to pursue PHIUS certification. The Passive House walls consist of metal studs covered with sheathing. The roof is concrete. The building is completely coated on the outside with a liquid-applied air-and-water barrier. To minimize thermal bridging, the shell is wrapped with 3 to 8 inches of foam insulation. The windows are a mix of triple-pane tilt-and-turn and fixed units with a .088 U-factor (R-11) and a .32 solar heat gain coefficient. Heating and cooling are provided by individual heat pumps with the compressors mounted on the roof. Ventilation is provided by a single whole-building HRV ducted to each unit. Many strategic design decisions were made in keeping with the firm’s desire for sustainability. The building incorporates low-flow water fixtures and Energy Star appliances. The exposed concrete floors were a smart material choice that requires little maintenance and produces minimal volatile organic compounds, limiting off-gassing and improving indoor air quality. PM Architecture also strove to reduce its carbon footprint by utilizing fly ash, a recycled component, in its concrete, and installing reclaimed tiles wherever possible. Although this was the firm’s first Passive House, it successfully completed the project with no significant difficulties. According to Mehta, this was due to the firm’s construction experience. Technocraft often produces mock-ups of challenging details, such as window and door assemblies, the building’s EIFS skin, and moments of transition from, for instance, the EIFS front to the insulated roof. These mock-ups provide unique insight into how to successfully construct the details, eliminating a lot of guesswork and resulting in efficient production. Furthermore, the building’s massing was thoughtfully streamlined. 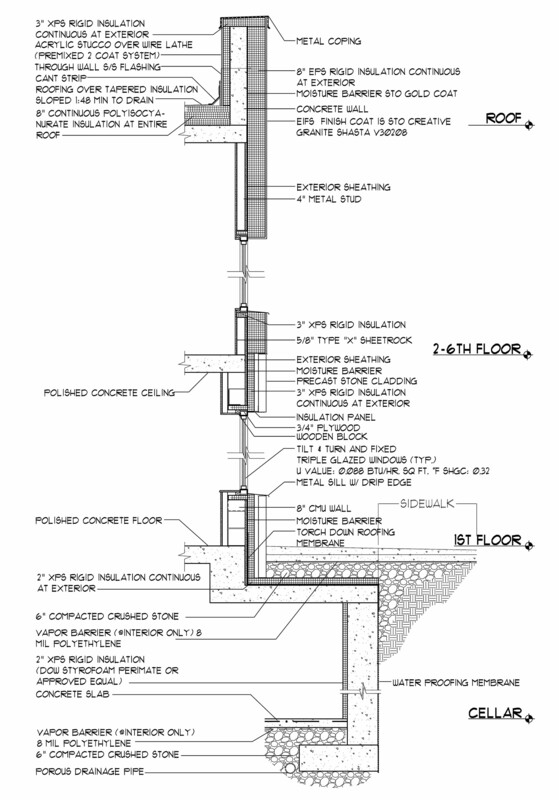 There are no balconies or overhangs that might create unfavorable thermal bridging. The team was easily able to air seal and wrap the whole building with insulation. This Washington Heights multifamily Passive House building is a testament to the success possible with integrated project team delivery. When all parties work closely together, striving toward a common goal, an elegantly simple and yet highly functional design can be achieved.